Because Polyart is a synthetic paper, drying can be more challenging. At Kingfisher we have many years experience in working with Polyart and as such have perfected the art of printing and finishing using this versatile synthetic material. The list is endless. Contact us now for samples. View a copy of the Polyart Technical Sheet. We have worked with Ben Searle from Cycling Guides.com to produce a cycling guide for the Forest of Dean. The cycling guide, which has been recently featured in the Guardian Britains Best Bike Rides, has been produced using polyart. Right from the start I wanted a tough waterproof base for a series of guides. I took a while to find a suitable substrate. I googled widely and contacted a number of printers who use Polyart or alternatives. From first contact Kingfisher were extremely helpful, encouraging and always amazingly prompt at getting back which is very refreshing! Early tests proved that Polyart could be machine folded as required. Kingfisher have worked hard to get the very best from Polyart and I am very pleased with the results. Polyart is a highly durable, tear, water and grease resistant material making it ideal for outdoor use. 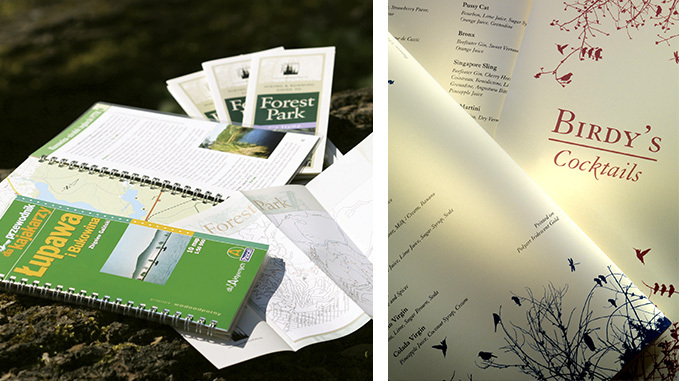 The maps we have produced for cyclingguides.com are folded to a handy size so that the rider can negotiate the acres of woodland confident that whatever trail they follow the map will provide the route rain or shine!! Read more about Polyart in action here with SUTMAP.